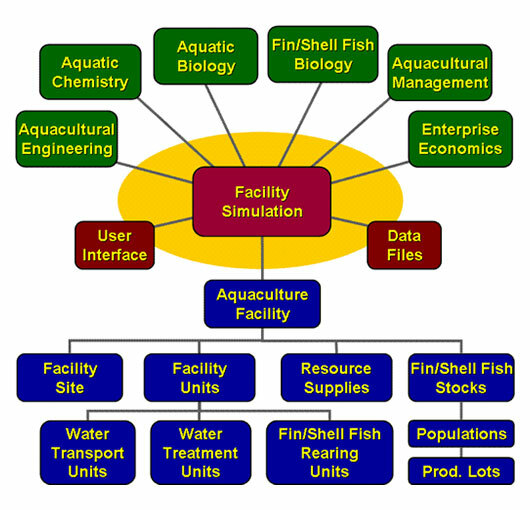 The software architecture and components of AquaFarm are shown below. 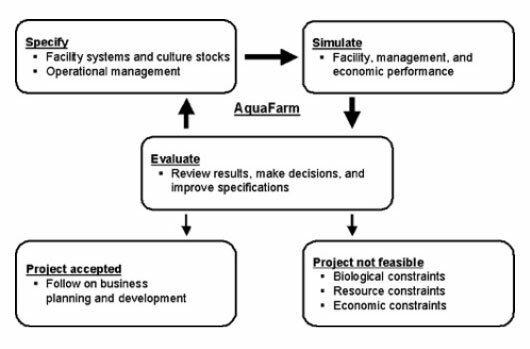 AquaFarm uses an interactive, iterative, three-step procedure to specify, test, and evaluate system designs and management protocols. First, comprehensive specifications of the facility design and management are established, using mapping and design work sheets. Second, the performance of this user-specified system is tested, using engineering-based simulation procedures over designated production periods. Third, predicted facility performance is reviewed and evaluated, using tabular and graphical reports of the physical, biological, and economic performance of the facility. The figure below illustrates this procedure.